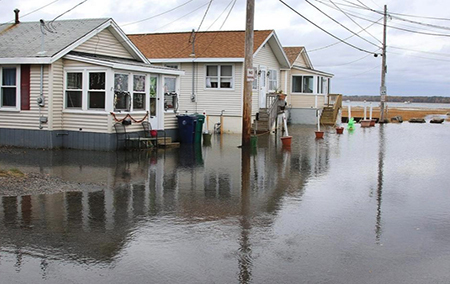 Flooding caused by rising sea levels has cut the value of New Hampshire coastal properties by $15.2 million, part of a total of $403 million in value list across New England. According to a report compiled by the First Street Foundation and researchers at Columbia University, increased erosion and tidal flooding are responsible for the reduction in property values between 2005 and 2017. The data comes from the U.S. Geological Survey, the National Oceanic and Atmospheric Association, the U.S. Army Corps of Engineers and home-sale data. And there seems to be no light at the end of the tunnel. According to the report, the Army Corps of Engineers expects a sea level rise across coastal New England of 1.7 inches in five years, 3.6 inches in 10 years and 5.6 inches in 15 years. By far the hardest-hit New Hampshire community is Hampton Beach, according to the report, where property values have dropped a total of $7.9 million during the period, according to the report. The others most affected are Hampton, Dover, Portsmouth and Exeter. By state, Massachusetts lost the most value, $273.4 million, over the 12-year period, followed by Maine at $69.9 million, Rhode Island at $44.7 million and New Hampshire at $15.2 million. While most of the affected homes did appreciate over the studied period, they did so at a significantly lower rate than comparable homes unaffected by tidal flooding. The research is also the first to find that in addition to direct property-lot flooding nearby road flooding also has a major impact on home value. The researchers said theirs is the first to quantify the negative impact of increasingly frequent flooding on the housing market. By taking into account characteristics associated with home value, such as square-footage and proximity to amenities, and accounting for economic trends like the 2008 housing recession, the scientists said they were able to isolate the impact that increased frequent tidal flooding caused by sea level rise has had on home value. As part of the research, FloodiQ.com, a searchable database, has been set up to provide information about comprehensive flood risk and property value loss to homeowners and others.